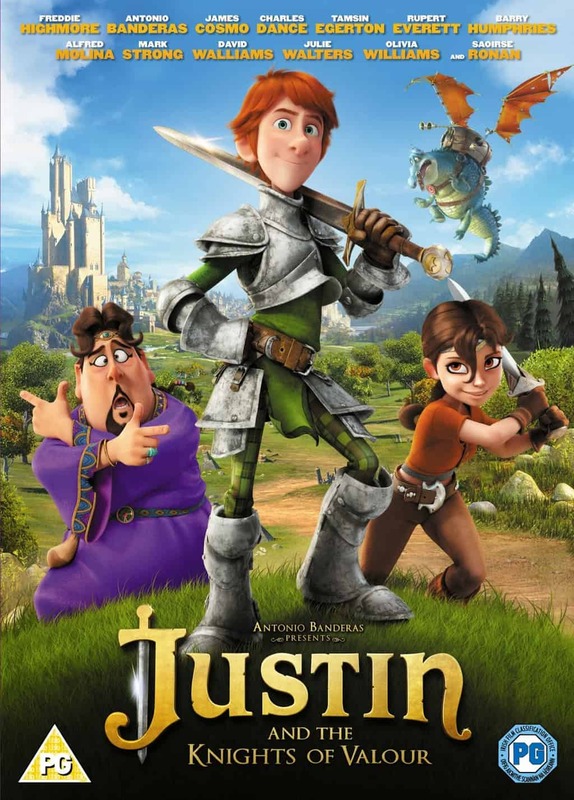 Join Justin on a quest to follow his heart… Produced by Antonio Banderas and featuring the voice talent of an all-star cast Justin and the Knights of Valour is a charming, animated adventure full of fun characters that will be loved by families. Young Justin lives in a kingdom without knights! He dreams of following in his Grandfather’s footsteps and becoming one of the famed Knights of Valour but his father wants him to settle down to a life without adventure. Inspired by his Grandmother Justin decides to follow his heart and embarks upon a daring quest to become a knight by himself. Along the way he meets a host of entertaining characters including the beautiful and feisty Talia, a quirky wizard called Melquiades, a very serious monk and the handsome Sir Clorex, who teach and test him in the ancient ways of the Knights of Valour. Justin’s newfound skills are called upon all too soon when a banished knight returns to the kingdom and threatens to destroy it. Starring the voice talents of Antonio Banderas, Freddie Highmore, Saoirse Ronan, Charles Dance, Mark Strong, Olivia Williams, Rupert Everett, Julie Walters, Tamsin Egerton, Alfred Molina and David Walliams Justin and the Knights of Valour would make a perfect family gift for half term. A classic knights fairytale with a modern twist, Justin seems an unlikely candidate to become a knight but throughout the film you are reminded of his determination. We all enjoyed sitting down to watch this family friendly film. It has both a male and female heroines so appeals to both boys and girls (and adults) alike, and if you find your children asking for a Knight’s shield may I suggest you pop over Red Ted Art as she has an easy to follow ‘How to make a knight’s shield‘ tutorial. Disclosure: We received a promotional copy of Justin and the Knights of Valour DVD FOC for the purpose of review.